It’s that time again. 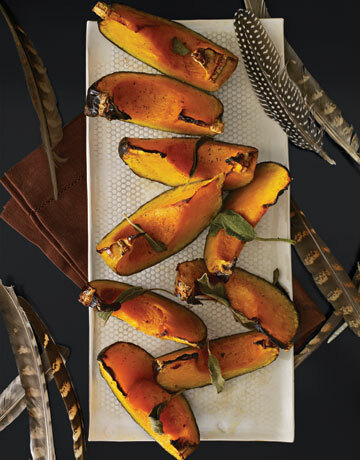 The collection of spices in this recipe takes the squash to a completely different place. When you bake the squash, open the kitchen windows and expect your neighbors to stop in. What a great idea! Cut the squash in half, remove the seeds. Cut the two squash halves into several sections following the ribs and place into a large bowl. Toss with the brown sugar, butter, olive oil and spices and salt. Bake 450 degrees for 15-20 minutes—or… 350 degrees for 45 minutes. Subscribe to comments with RSS	or TrackBack to 'Roasted Acorn Squash'. Yum!!! I’m trying the acorn squash……..sounds incredibly good!!! Thanks for the continuous kitchen help to one who is willing to keep trying!!!! Brian and I were just looking for a squash recipe. This may be it! Hmmm. ingredients I don’t normally use….I MIGHT try this recipe….lots of squash out there right now. must have been a good growing season for it with our lack of summer.